Have you ever wished that you could keep your car looking as pristine as the day it was purchased? 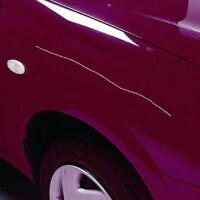 Driving a new car away from the dealer’s lot begins the erosion process of pitting and chipping of the new paint. Many car dealers and shops are now offering an innovative way to protect your investment with a product that keeps vehicles looking “car lot new. “Paint protection film,” or a clear bra, keeps exposed surfaces of a vehicle protected from gravel road detours, road construction and parking lot mishaps. Automobiles and recreational vehicles are second only to home ownership as the average Americans largest investment and paint protection film helps protect that investment. Paint protection film kits were developed in the past decade originally to protect the rotor blades of Armed Forces helicopters from damage due to sand particles in operation Desert Storm. Companies like 3M and Avery Dennison have continued to refine the product and kits are available now that are custom cut to fit a wide range of vehicles including automobiles, motorcycles ,trucks, big rigs, and recreational vehicles. Automotive paint protection film has the advantage of eliminating some of the more common problems associated with traditional products like leather hood bras that can trap dirt that rubs off paint. The film also protects against UV damage and degradation when professionally installed. Installation is similar to window tinting or even wallpapering, where experience and expertise are required for the best possible outcome. Automotive film is available in either a standard or deluxe kit. The deluxe kit adds film pieces to protect bumpers, spoilers, mirrors and painted grills. There are additional options from some manufacturers. The film is not designed to protect chrome. Installation can take as little as twenty minutes for a car, or in the case of an RV, up to five hours. As with most detailing, a quality outcome requires quality application. Automotive paint protection film forms an invisible auto bra that can be waxed and maintained just like a painted finish to maintain the original high gloss shine of automobiles. Quality auto clear bra paint protection film is designed to be removed without damaging painted surfaces. The film is non-yellowing and abrasion resistant and is flexible enough to be applied to watercraft, aircraft, consumer electronics and almost any smooth surface which may be vulnerable to abrasion. Currently used on most NASCAR vehicles, automotive paint protection film offers off road enthusiasts a great way to protect their vehicle from gravel, brush, tree branches and the sun. Film manufactured in the United States and Germany is generally superior to their Chinese counter parts. Consumers are encouraged to research available products prior to professional installation. Paint protection film manufacturers continue to look for innovative ways to improve product and advance marketing. Companies like Roland Advanced Solutions Division (ASD) and 3M‘s Automotive Aftermarket Division offer auto dealerships and restyling professionals computerized paint protection film solutions which combine digital cutters with film products for turn-key delivery. We all know that the minute we drive our new car away from the dealer, its’ value drops very quickly. Anything we can do to perserve that value, no matter how incremental, is noteworthy. This product deserves consideration for that reason alone.